Hi, in this post I would like to share trick for adding value help to parameter in analytical query. Parameters in ABAP CDS view could be used as mandatory, single value variable, which could be used when split of calculation logic required. By default parameters don’t have value help, like filtration option based on fields at consumption level. I. Create ABAP CDS view for dictionary based on table or some dummy table (like in this blog). II. 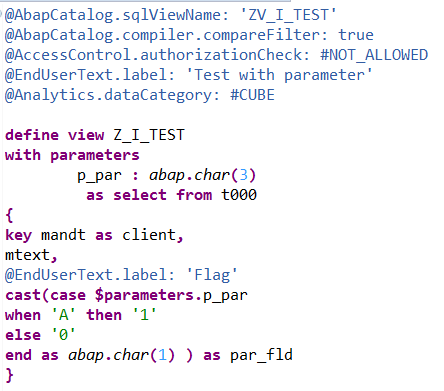 Create ABAP CDS cube with required logic. For demo I use just select form T000 table. There is parameter p_par used in logic. 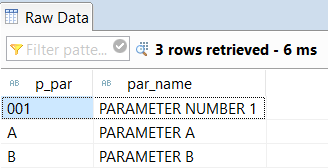 This parameter is not linked to any of fields in ABAP CDS view. III. Create ABAP CDS analytical query with required logic. IV. Result query in Analysis for Excel. Value help button exist. For simple parameter dictionaries this approach could be useful. Another nice blog by Maxim! b) no spaces allowed. No error will be generated but you just won’t see your value in list. So you can’t use key values like ‘Magic Wand’ or ‘MAGIC WAND’. You have to use ‘MAGIC_WAND’. Hope, issue with absence of text for parameter’s value will be fixed soon and my comment will depreciate. Hello, nice how-to. Another way to accomplish the same goal could be creating a new domain in SAP and then associating the parameter to the domain( Parameter as domainName) . Hi Maksim, you seem to have deep knowledge of CDS Annotations. Could you kindly reply to my question here ? I am using I_Ledger in an association to populate value help for RLDNR (Ledger of General Ledger account) parameter in my view on ACDOCA table, but unfortunately value help is not displaying. Any clue, what I am missing here. Appreciate your help. If it is possible in your case try to use analytical query consumption filter instead of parameter. They allow more agile way to enter values. In this case you need to create assosiation at cube level. Thanks for your recommendations, but I am trying to create a view using ACDOCA only and therefore using @Analytics.datacategory: #CUBE annotation for same. 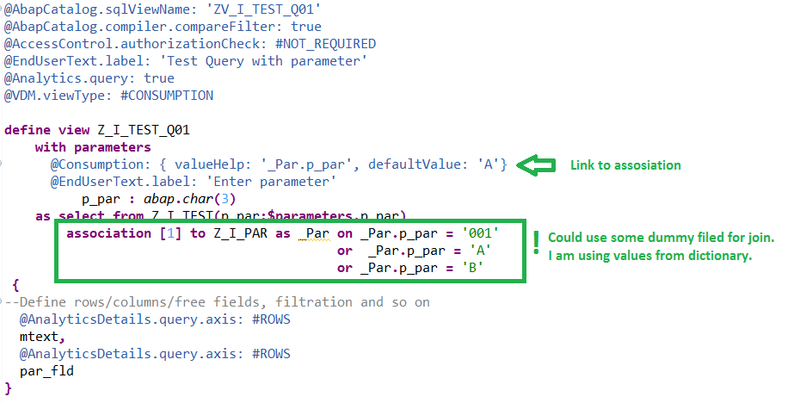 So, when I am try to include @Analytics.query: true within same code, then ACDOCA table becomes inaccessible. In the end, I have to comment @Analytics.query: true to successfully activate the program, but value help for Ledger still not showing up in Analysis for office. Below is piece of code developed by me. Analytical query CDS view should be another view above Cube CDS view. In result value help will be formed automatically from associations. 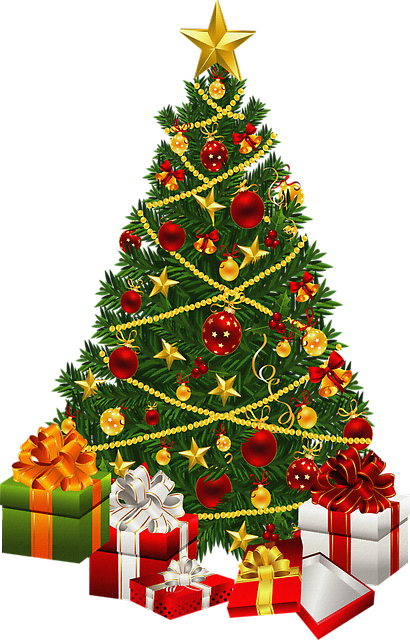 Shall reach out to you in case required. I am able to display the value help for Ledger as recommended by you, but facing issues while coding value help for other parameter like ‘Company Code’. Below is the code, I am trying to design. Let me know, what I am missing here. thank you for sharing your ideas – I think I can follow your descriptions. However I am wondering about a more general architectural question and I would be interessted in your opinion. Your solution is based on an association to a “Value Help CDS View”, which is implemented on Query View level. You already stated that “generally the associations should be implemented in the cube but here you think an exception is valid”. According to my general understand, I also know this guideline about “no associations in Query Views”. I am now wondering about my more general usecase, where I want to consume my Query View via FIORI Elements Analytical List Page. Here I need more value helps, especially on Dimension attributes, as I want to define some compact filters. Do you know, how the guideline (or maybe a Best Practise) looks like here to achieve this? Technically I think I know, which annotations to use but I am struggling to find an answer, where to implement this – Query or Cube?